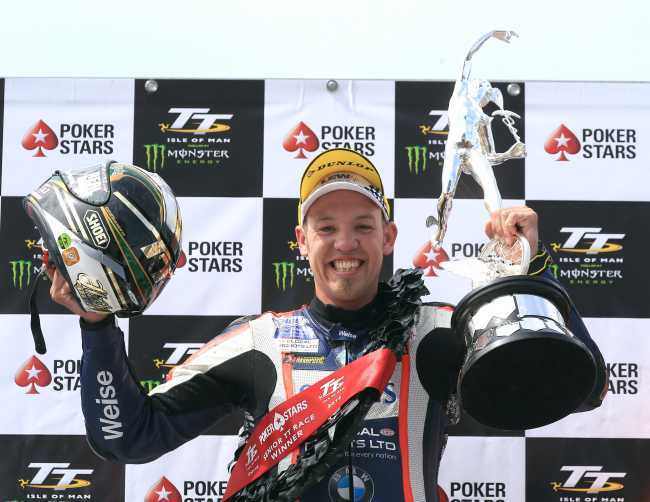 A packed trackside crowd were treated to one of the greatest races in the TT’s long illustrious history as Peter Hickman won a sensational PokerStars Senior TT race at the Isle of Man TT races, fuelled by Monster Energy, on Friday when he set a new outright lap record of 135.452mph on the final lap to defeat Dean Harrison by just two seconds. The pair featured on the cover of the Official TT Programme and the ‘H-Bomb’ feature only hinted at the spectacular race that was to unfold at the climax of this year’s TT meeting as lap, race and sector records were all obliterated as the pair battled for the historic trophy. Harrison had led the race for five and a half of the six laps but Hickman reeled him on the sixth lap and, having been quicker over the Mountain all race, he turned a 3.7s deficit at Glen Helen into a lead of 0.8s at the Bungalow and he smashed the race record by 48.064s to take his second win. Harrison took second with Conor Cummins in third. Harrison led Hickman by 1.2s through Glen Helen on the opening lap with Dunlop a further second back in third as Hillier, Cummins and David Johnson completed the top six and by Ramsey, the Kawasaki rider had doubled his advantage to 2.4s. Dunlop remained in third but was some 8.4s behind Hickman. Hillier’s strong week ended though with a retirement at Westwood. Cummins led on the road with a lap of 131.754mph but it was Harrison who led with a lap of 133.678mph. However, Hickman was only 1.4s behind although Dunlop’s challenge looked to be already over as he was almost 13 seconds behind his fellow BMW rider. Cummins, David Johnson and Josh Brookes completed the top six but Johnson pulled into the pits to retire promoting namesake Gary Johnson into sixth. Leading privateer Sam West was close to his maiden 130mph lap in eighth with newcomer Davey Todd performing superbly in tenth. Through Glen Helen on lap two and Harrison had edged away from Hickman again to the tune of 3.5s with Cummins now third as Dunlop slipped further back. Brookes was up to fifth and West now a superb sixth and Todd a stunning eighth. Harrison had added another second to his lead as he rounded Ramsey Hairpin and he came into his first pit stop at the end of lap two having lapped at 133.704mph. His lead had been slashed though with Hickman now only 1.4s in arrears once more. Cummins, Dunlop, Brookes and West rounded out the top six. Todd was now in eighth. After the pit stop and through Glen Helen for the third time, Harrison’s lead had crept out to 4.8s and the duo were over half a minute clear of Cummins who was now coming under pressure from Dunlop with the gap just over half a second. Throughout the first half of lap three, Harrison continued to pull away, with his lead at Ramsey over eight seconds, but Hickman was again quicker over the Mountain and as they started lap four, the difference between the two was back down to 5.8s. Cummins was looking more comfortable in third with Dunlop now 13.6s behind in fourth as Brookes and West held onto fifth and sixth. At Ramsey Hairpin on lap four, Harrison had stretched his lead over Hickman to 6.9s but Hickman again showed his strength over the Mountain reducing the deficit at the Bungalow to 4.4s. And he wasn’t done there either, setting a new outright lap record of 134.456mph on his way into the second pit stop, the gap now just 1.402s. The order behind stayed constant as Cummins pulled further away from Dunlop with Brookes looking comfortable in fifth but Gary Johnson had overhauled West for sixth. The second and final pit stop saw changes though as by Glen Helen on lap five Harrison’s lead had shot back up to 6.2s although by Ramsey Hickman had shaved 1.2s off despite his engine sounding significantly louder than how it started. It was down to 3.6s at the Bungalow, 2.5s at Cronk ny Mona and as Hickman crossed the line to start the final, thrilling lap, his deficit to Harrison was only 1.9s. Harrison’s superiority over the first nine miles saw him open up the margin to 3.7s as traffic also came into play on the final lap and he pulled even further away on the high speed run to Ballaugh, his advantage now 5.7s. However, Hickman really flew on the run to Ramsey bringing the lead down to just two seconds and by the Bungalow, he’d taken the lead for the first time by the slender margin of 0.834s. He doubled that at Cronk ny Mona but all eyes were on the chequered flag and Harrison crossed the line with a new lap record of 134.918mph/ 16:46.742 which he held for forty five seconds before Hickman crossed the line in a sensational, new outright lap record of 135.452mph, pipping Harrison to the race win by two seconds. Cummins was over a minute and a half back in third with Dunlop, Brookes and Johnson finishing in fourth to sixth, Brookes’ final lap of 131.745mph the fastest by Norton and by an Australian. West’s superb ride ended on lap five and although that promoted Phil Crowe up into seventh, the Lincolnshire also went out after coming off at Whitegates on the final lap, fortunately without injury, and the eventual seventh place finisher was Martin Jessopp with Jamie Coward, Todd and Brian McCormack completing the top ten. Dunlop’s fourth place was enough for him to pick up the Joey Dunlop TT Championship with 94 points, with Hickman (86) and Harrison (81) taking second and third. Todd’s brilliant week saw him pick up the TT Privateer’s Championship as well as the Newcomer’s Trophy. Swedish rider Bjorn Gunnarsson had an accident at Glen Tramman and was taken by airmed to Nobles hospital and treated for bruising while Dom Herbertson (Laurel Bank), Mike Norbury (Keppel Gate), Michael Mylchreest (Gorse Lea) and Philip Crowe (Whitegates) also came off their machines during the race but all were reported as unhurt. Photos Stephen Davison / Pacemaker Press Intl.